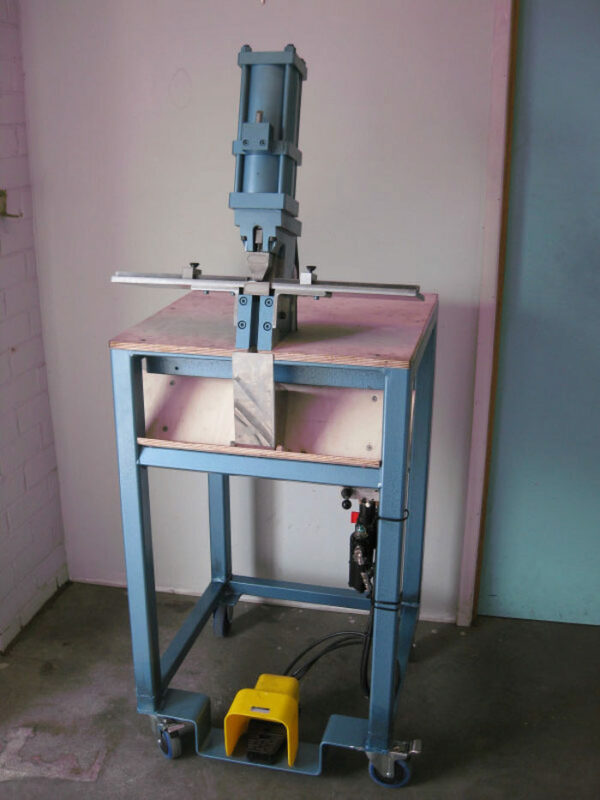 This machine is very compact, having a small footprint on the factory floor whilst having a very wide capability, As the name suggests it is specially designed to accept Quick-Change Tooling that enables all types of rule to be processed faster, more easily and more efficiently, with less skill and training required with a more fool proff method of processing different types of cutting rule. The Speedex Quick-Change Notcher is extremely versatile. There is almost no rule cutting operation that it cannot do that is commonly employed by any die board manufacturer. The Speedex Quick-Change Notcher machine is pneumatically operated so the machine is quiet to run, and also requires less manual labour, contributing to greater operator comfort and ease of cutting operations. It is ergonomically designed on a 15 degree tilted back angle so that an operator can see what they are doing and also assists in holding cutting rule in place inside the tooling. 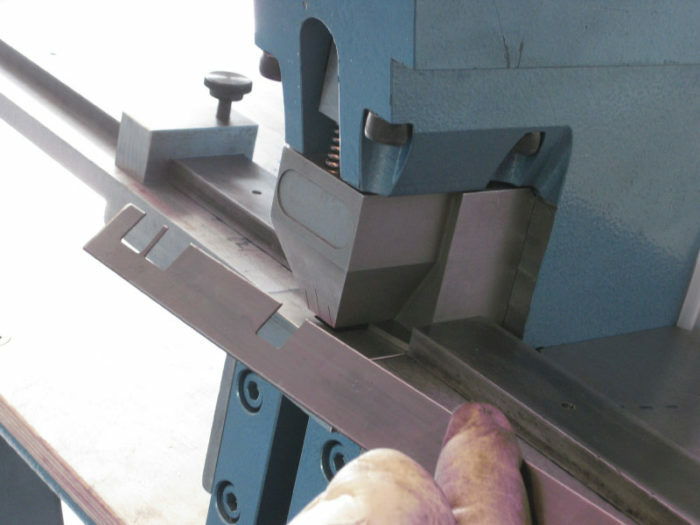 The Quick-Change Tooling fits snuggly inside the machine's body and all Quick-Change Tooling has been designed with narrow openings to prevent any danger to an operator's hands. 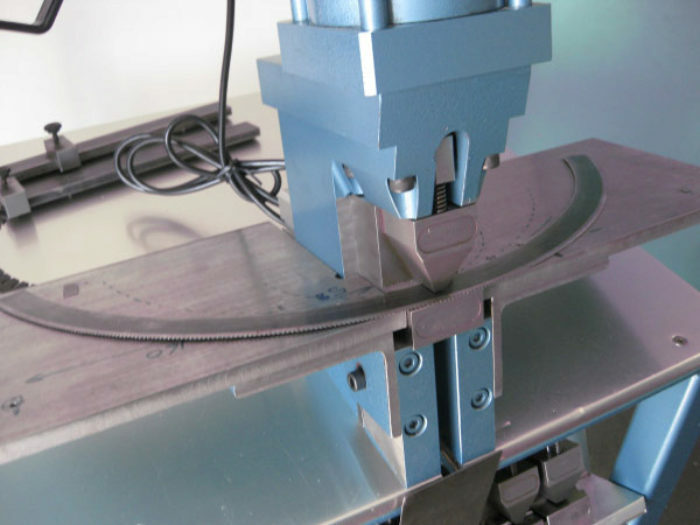 The Speedex Quick-Change Notcher features a universal tooling clamping system so all tooling is quickly changeable. 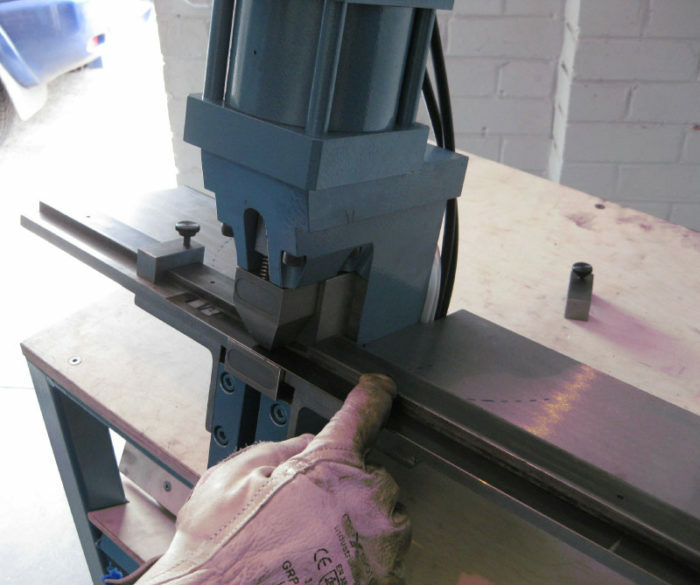 So a simple turn of a lever will release or clamp the tooling securely in place. No need to undo any screws! The hydraulic cylinder is operated by a foot pedal to control punching, so both the operator's hands are free to work. 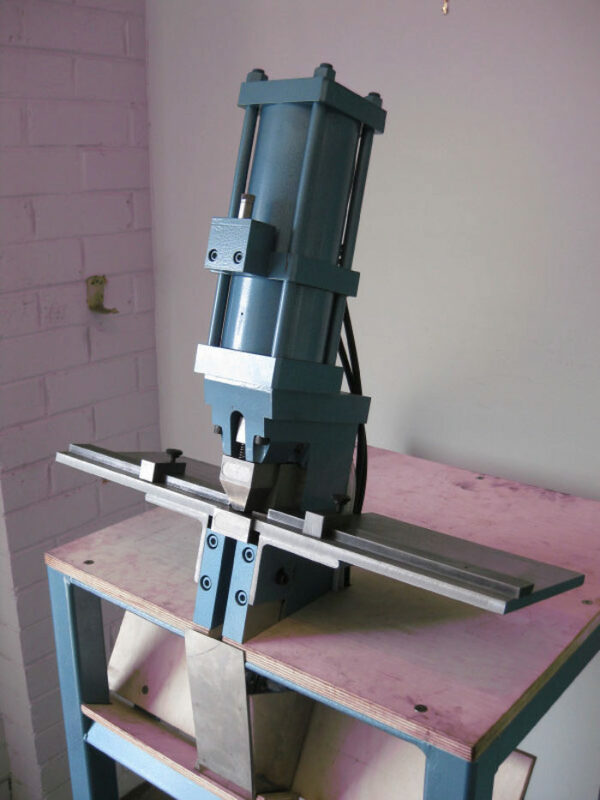 The Speedex Quick-Change Notcher is light weight and can be mounted on a mobile trolley, which we also can supply, enabling the machine to be moved around the factory floor where required. Trolley has shelving to store tooling and collect waste slugs, as well as a strong base for the machine and a sturdy mobile work bench. Above: Speedex Quick-Change Notcher upclose, notice adjustable Right Hand & Left Hand Rule Guides / Stops are in place. Side Rule Supports are also adjustable. Also notice that there is provision in the trolley bench for a slug container under the machine to collect and empty watse slugs easily. There is also a lower tool shelf for storage of tooling and positioned where operator can easily see and changeover tooling. The above photo shows straight die cutting rule inside the machine. 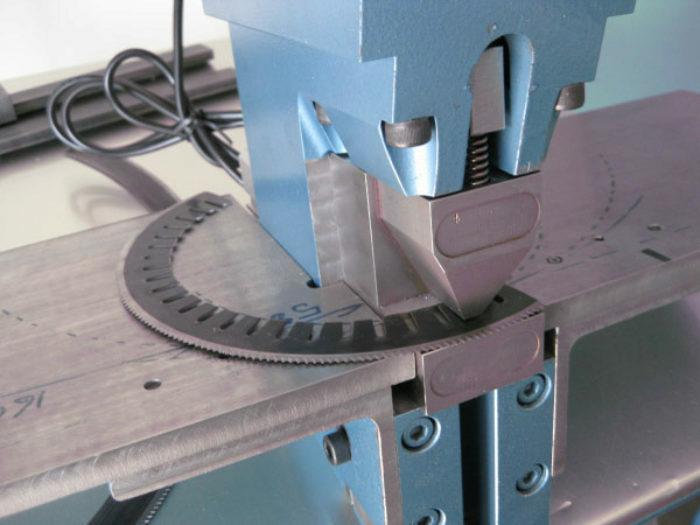 The above photo shows an example of how small diameter rotary rule (177mm diameter) can be accomodated in the Speedex Quick-Change Notcher and can be notched full circle if need be due to adequately designed clearance all around the machine. 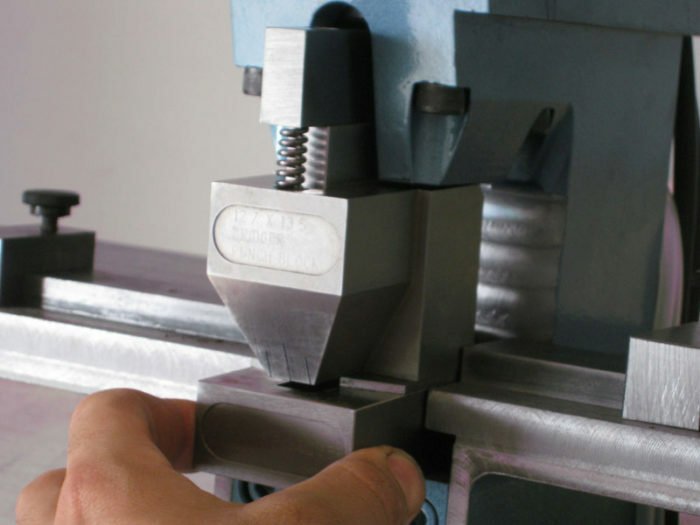 The above photo shows how Quick-Change Tooling can be easily changed over. 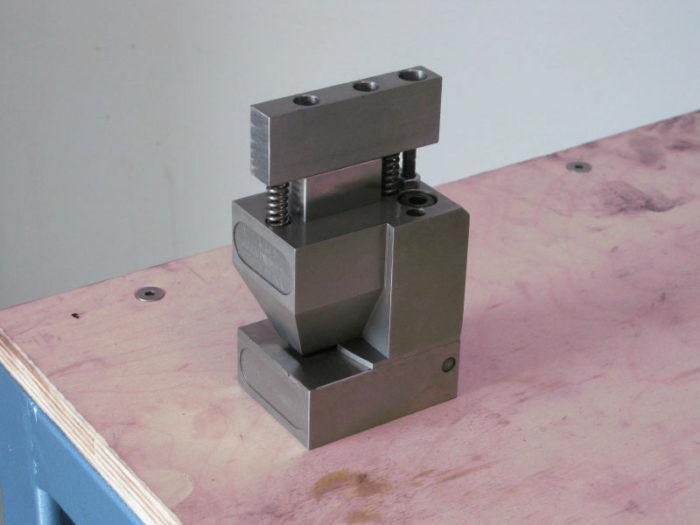 The above photo shows an example of a 12.7mm wide x 16.5mm deep Notching or Bridging Quick-Change Tooling and how effectively it manages to cut through 4PT rule. 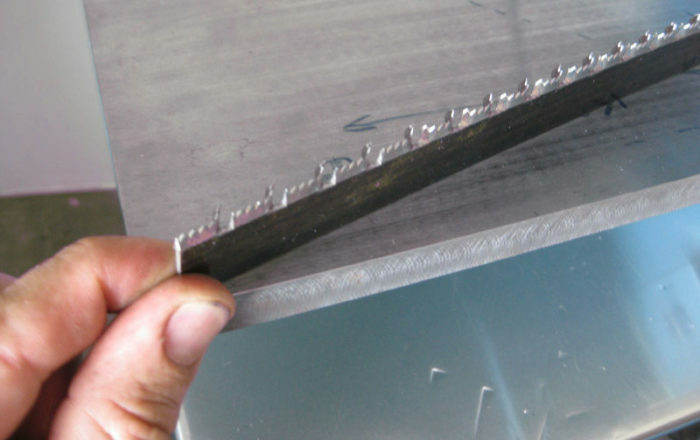 The above photo shows the Quick-Change Tooling itself. The above photo shows an example of 2 different Curved Rule Notching Tooling. 10 x 18 deep and 4 x 18 deep. The above photo shows an example of zipper notched serrated rule that can be cut and bent on our Speedex Quick-Change Notcher. A brief overview of tooling available below (please note that not all sizes are listed below, and tooling can be supplied to suit your requirement, so please let us know your exact requirements and tooling can be supplied to suit). 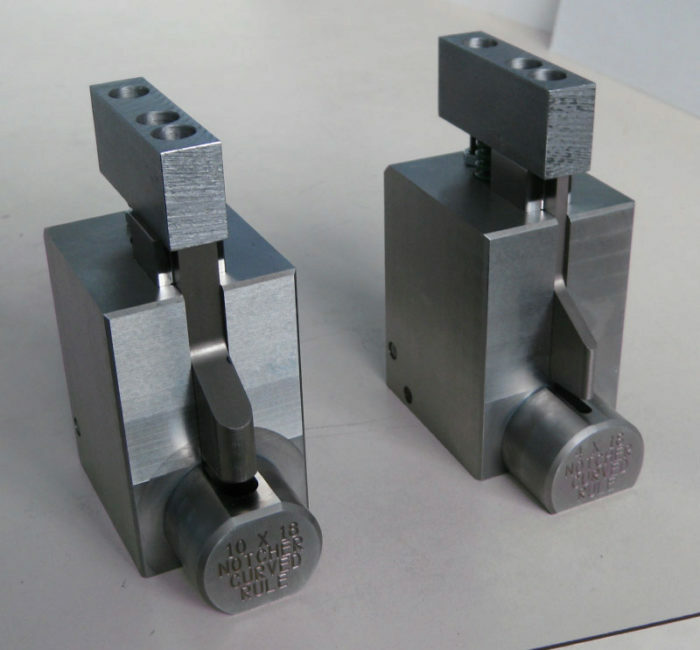 Tooling made to suit many different height cutting rules, so one tool will lipper cut many height rules. Made to suit different styles of cutting rules.